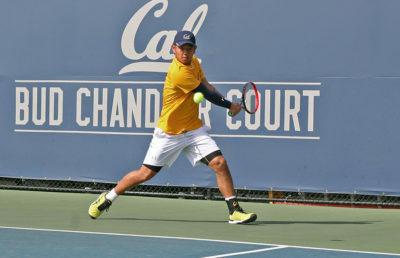 Cal men’s tennis had a quick turnaround from the regular season to postseason play. After losing to Oregon in their regular season finale, the Bears were slated to play the Ducks once again just days later in the quarterfinals of the Pac-12 Championships. Although Cal mustered up one more point this time around, the team dropped the match, 4-3. The close contest came down to the wire, as the action on the No. 1 singles court became the decider with the score tied, 3-3. “I think we played much better in singles, especially at the lower end of the lineup; however, we are still struggling in doubles overall,” said Peter Wright, Cal’s director of men’s tennis. 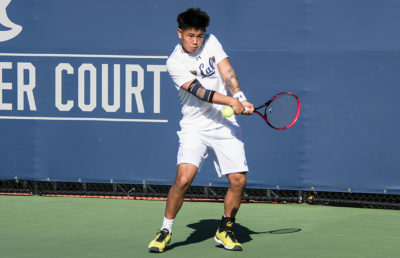 In the previous matchup, the Bears were able to secure the ever-important doubles point, but Cal’s young pairings were unable to duplicate that success. Cal’s duo of freshmen Can Kaya and Jack Molloy fell flat against Oregon sophomore Ty Gentry and senior Simon Stevens, losing, 6-4. Meanwhile, the other Cal pairing of sophomore Dominic Barretto and freshman Ben Draper were dismantled by freshman Charles Roberts and junior Armando Soemarno, 6-2. “It was just a little unfortunate today — losing the doubles point put us in too much of a hole to dig out of, and even though it was a loss, I was still pleased with the effort I saw out there today,” Wright said. The Bears fought well in the singles play, winning matches at the bottom of the lineup and forcing third sets elsewhere, but they could not complete the full comeback. The doubles point turned out to be the crucial factor, as it often is in these matches. Cal now awaits the start of the NCAA tournament at the end of the month, with the match location still to be determined. They have already qualified for the tournament but will most likely not be a top-16 seed with the opportunity to host the opening rounds. Wright and his team have time to practice and implement positive changes on the court in preparation for the NCAA Championship. Little by little, Cal will make these adjustments so that it can execute in the important moments. The Bears only have one chance left to prove themselves this season, so all their focus and energy can now be channeled toward the final tournament of the year.